This simulation explores how greenhouse gases affect Earth's climate. Students can view levels of atmospheric greenhouse gases present during Earth's last Ice Age, in the year 1750, today, or some time in the future.....and observe how the Earth's temperature changes. Levels of 4 greenhouse gases are displayed: water, carbon dioxide, methane, and nitrous oxide. Add cloud cover to the simulation and observe the resulting temperature changes. Choose the tab "Glass Layers" to see what happens in an ideal greenhouse model. In the third simulation, students can adjust levels of atmospheric gases, then shoot infrared and visible photons from a photon emitter. How do the gases influence photon absorption? 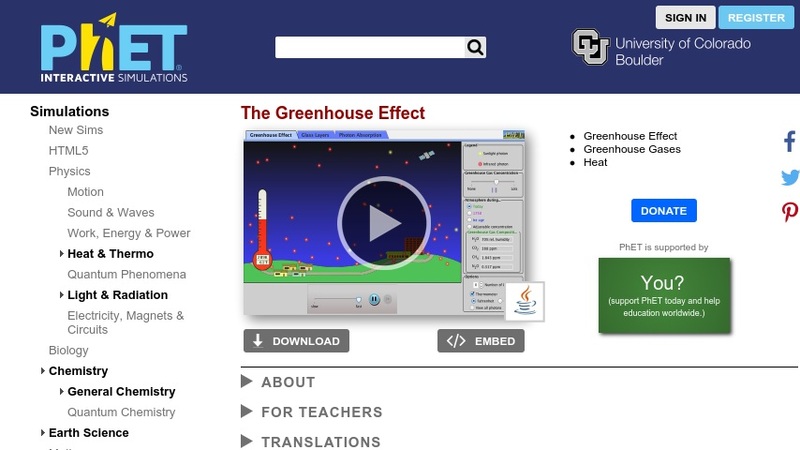 See Related Materials for a comprehensive student guide that explains how to use the "Greenhouse Effect" simulation to conduct a lab experiment. The experimental question: Which atmospheric gas is the best absorber of infrared photons? This item is part of a growing collection of simulations by the Physics Education Technology Project (PhET). Simulations were designed using principles from physics education research and refined based on student interviews and classroom observations.